Select Size 66" x 80" x 2.5" 54" x 80" x 2.5"
This portable massage mat for traditional Shiatsu and Thai massage disciplines is filled with untreated cotton batting. Available with or without a removable and washable cotton slip cover. This Thai mat is wide enough for both the practitioner and the patient to stretch out comfortably. 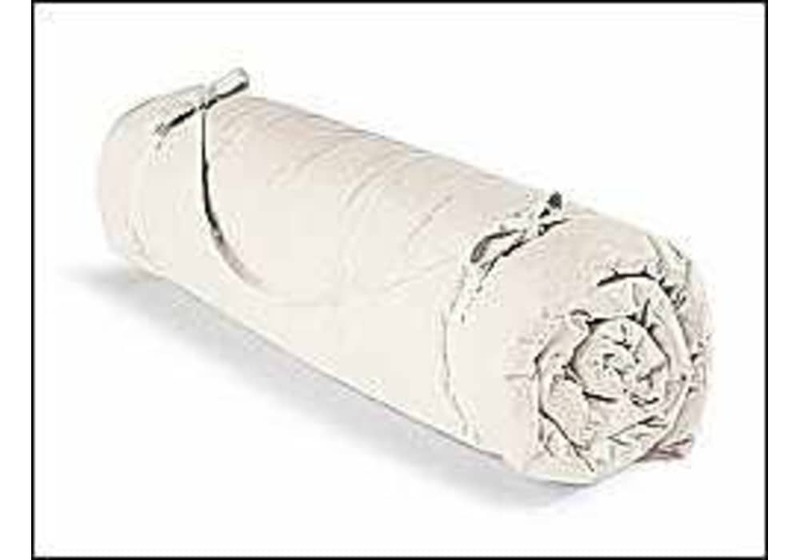 54"x80"x2.5" (Standard) or 66"x80"x2.5" (Large) cotton surface provides a nice thickness for ample cushioning, yet is still light enough to be portable with its roll up ties and attached carrying strap (strap only available in Standard size). Perfect for body work and even road trips! Unbleached, untreated, natural, non-removable cotton shell. Filled with approx. 20 lbs (Standard) or 24 lbs (Large) of pure, natural, untreated cotton batting. Convenient shoulder carrying strap (strap not available on Large size) for easy carrying to class. Attached ties for easy roll up and storage. Standard: 54" x 80" x 2.5", approx. 25 lbs. Large: 66" x 80" x 2.5", approx 29 lbs. Optional Slip Cover: A separate, 100% cotton, washable, slip cover for our massage mat protects your massage mat for years to come. Available in either natural (unbleached, untreated, natural color), navy blue, black or purple . Due to sweat, dirt and skin oils, this easily washable cover will extend the life of your mat and keep it clean. The weight of the cover is approx. 5 pounds.